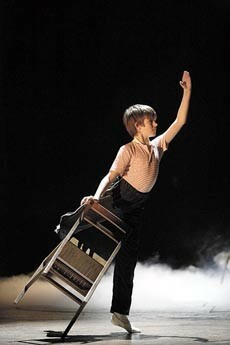 I called Elton John and Lee Hall’s “Billy Elliot: The Musical” irresistible when it opened in March 2005 and so it has proved as the tuneful adaptation of the well-regarded 2000 movie celebrates its second anniversary at London’s Victoria Palace Theatre. With a new cast in place including Travis Yates (left) as one of four lads who will rotate in the title role and Sally Dexter as Mrs. Wilkinson, the show is now booking through Dec. 20, 2008. It opens in Australia at Sydney’s Capitol Theatre in December and on Broadway next year. Casting is under way for those productions. Meanwhile, in London the other current Billy Elliots are Leon Cooke, Dean McCarthy and Layton Williams. Jackie Clune takes over as Mrs. Wilkinson on June 4. One of the most talented composers in the business, the busy Warbeck is doing the score for John Madden’s upcoming Elmore Leonard picture “Killshot” starring Diane Lane and Thomas Jane. My favorite Warbeck soundtrack is to Philip Kaufman’s 2000 story about the Marquis de Sade, “Quills” starring Geoffrey Rush and Kate Winslett. It’s filled with arrangements using found instruments and is altogether wonderful both in serving the film and as an album. But I digress. This entry was posted in Music, News, Notes, Theatre and tagged 'Billy Elliot: The Musical', Elton John, Lee Hall, Stephen Warbeck, Victoria Palace Theatre. Bookmark the permalink.